Virginia State Sen. Jennifer Wexton is trying to unseat incumbent Republican Rep. Barbara Comstock in Virginia’s 10th Congressional District. STERLING, Virginia – Republicans have maintained their hold on the immediate suburbs of Washington, D.C. in Virginia for decades. Despite the GOP lead dwindling every election cycle, Republican Rep. Barbara Comstock has held on to Virginia’s 10th Congressional District. That is likely to come to an end on November 6. 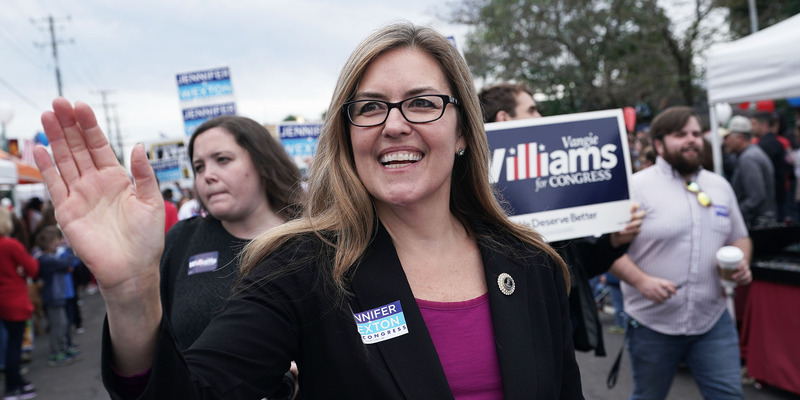 Every major poll of the district shows Democratic challenger and Virginia State Sen. Jennifer Wexton holding a sizable lead over Comstock. A significant factor – the mood of the district’s large portion of federal employees. And Madeleine Albright, the first female secretary of state, attended Wexton’s canvassing event on Saturday, telling the crowd of campaign staffers and volunteers, “it’s Article One time” in a nod to Democrats hoping to enact significant oversight of the Trump administration. Albright, who lives in Virginia’s 10th District, acknowledged the area’s shifting demographics and increasingly left-leaning voter turnout. The National Republican Congressional Committee (NRCC) is still pouring cash into the district in hopes of saving Comstock’s seat, shelling out nearly $US5 million in ad buys. Comstock has hammered Wexton for what she says will raise taxes, contribute to a culture of “resistance,” and make House Minority Leader Nancy Pelosi the next speaker of the House.